Great Egret (Bird Photos Courtesy of Larry Loeher). One and half million visitors flock to Malibu Lagoon and adjoining Surfrider Beach each year…and that’s not counting the birds! 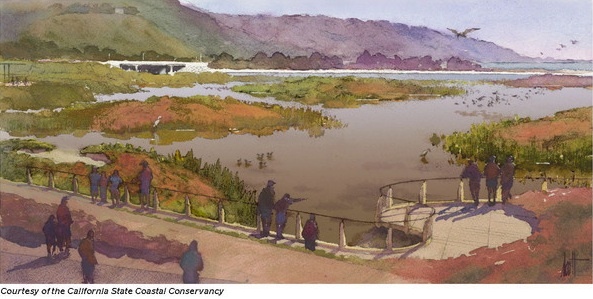 With the extensive restoration completed in 2013 and four years of plant growth, the Malibu Lagoon ecosystem is attracting birds and other wildlife in increasing numbers. Growing Solutions was a key player in the Lagoon restoration, growing over 65,000 native wetland plants and helping plant and maintain them over a two-year period. Our boardmembers Larry Loeher and Grace Murayama are avid birders, regularly monitoring and taking photos for the Santa Monica Bay and Los Angeles Audubon Societies. Least Terns and Snowy Plovers are again successfully nesting (after a 68-year absence) near the lagoon, tucked away in the sandy flats between the Lagoon and the Shore, and hopefully staying on the right side of the construction fencing put up to protect them from wandering dogs and beachgoers. We are pleased to see The Bay Foundation getting volunteers on-site to weed and maintain the site. For a recent article about protecting and respecting nesting seabirds in the Malibu Surfside News, Click Here! Photos used with permission by Larry Loeher. Former Growing Solutions intern and employee Andrew Yamagiwa made headlines last March with his chance discovery of a rare island endemic plant on remote Santa Barbara Island. From VC Star News, March 21, 2017: "A small, delicate-looking flower has been discovered for the first time on one of the Channel Islands. What’s known as the White Mallow has been found on Santa Barbara Island, which is part of Channel Islands National Park. Andrew Yamagiwa is a plant biologist who works in the Channel Islands, and says he noticed some of the white, and pale purple flowers as he was exploring recent plant growth on the island. He consulted with other specialists, and says it took a few weeks to confirm the discovery. Eventually a number of groups of the white mallows were found on Santa Barbara Island. The white mallows aren’t completely unknown to the islands. But, the last known sighting on Santa Cruz Island was in 1888, and Santa Catalina Island in 1902. Because the plants are so isolated between the islands, Yamagiwa says they could be subspecies. He says it would take genetic testing to conform it. The big question is why the plants have appeared at this time. They are from a plant family that’s common in desert areas, with seeds that can remain dormant for decades until conditions are just right. Yamagiwa spends days at a time on Santa Barbara and Anacapa Islands. 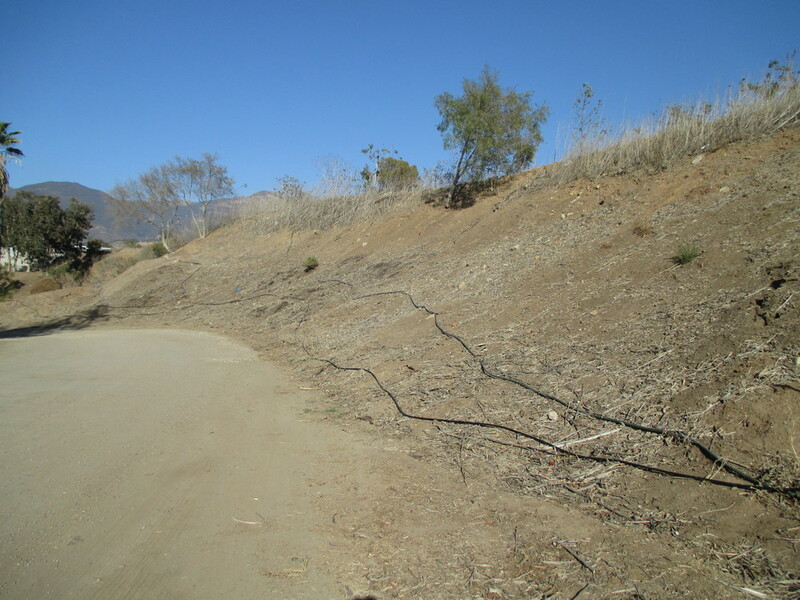 He’s working for the California Institute of Environmental Studies on a project to restore the native plant habitats for some bird populations hard hit by man-made pollution coming from Southern California." Meet our new Farm Intern, Joe Sacks. Joe has studied at Santa Barbara City College and is interested in putting his knowledge into practice as an intern in the Future Solutions program. Joe will spend six weeks working on raised garden beds planting artichokes and asparagus. He will put best management practices into play paying attention to pollinator habitat, wild animal movements through the landscape and soil building techniques. 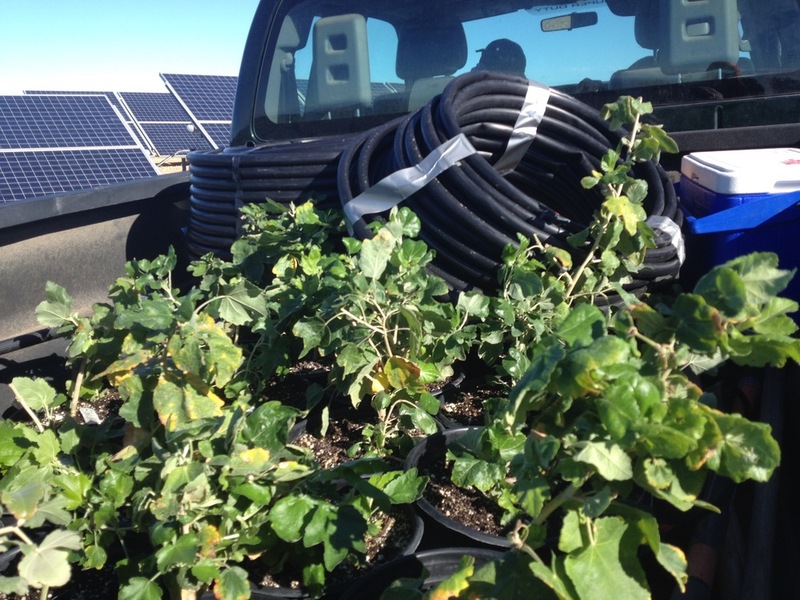 Growing Solutions is pleased to report successful ongoing rescue and recovery of the island bush mallow- Malacothamnus fasciculatus var. nesioticus (aka “MAFA”) on Santa Cruz Island. This species of plant is endemic to Santa Cruz Island, meaning it’s found on the island and nowhere else in the world. However, a century of overgrazing, primarily by sheep, reduced the bush mallow to three single plants scattered miles from each other, eliminating any chance at normal interspecies cross-pollination. Five years ago, under direction from USGS, Growing Solutions’ staff and volunteers located the plants, harvested cuttings and propagated over 500 plants in a purpose-built island nursery. 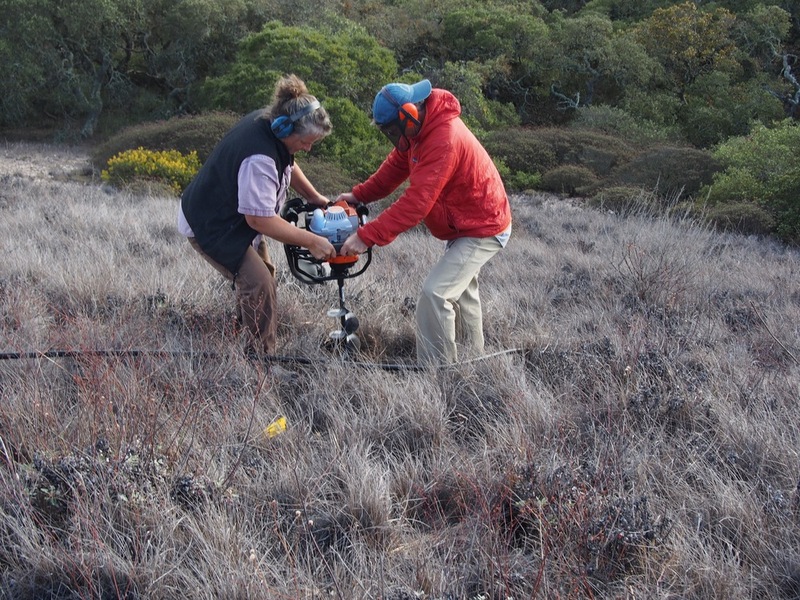 This January, under direction from USGS Ecologist Dr. Kathryn McEachern’s direction with the Channel Island National Parks’ full collaboration, suitable planting sites were chosen on the eastern end of the island. With Kathryn, her son Carson and Growing Solutions staff and board member Steve Barilotti we planted over 150 plants. Since then the plants have been regularly watered and monitored and we are happy to report the plants are doing well and even expanding by sending out root sprouts. We hope to see this species become a common sight for park visitors. Click on the purple blossom for more info on the Bush Mallow and other island endemic plants. Growing Solutions recently hosted a garden and compost workshop for those interested in organic food production and farming. Over the one-day hands-on workshop we did a sampling of tasks that included raised-bed planting, composting and intercropping of kale, onions and arugula. In an adjoining bed our participants sowed White Sonora wheat. This heirloom wheat was once widely cultivated throughout the Southwest as it requires less water than current commercially grown varieties. We concluded with building a compost pile through layering various organic ingredients (kitchen scraps, shell hulls, chicken manure, etc.) that bio-degrade quickly and “hot” to produce rich fertile soil. 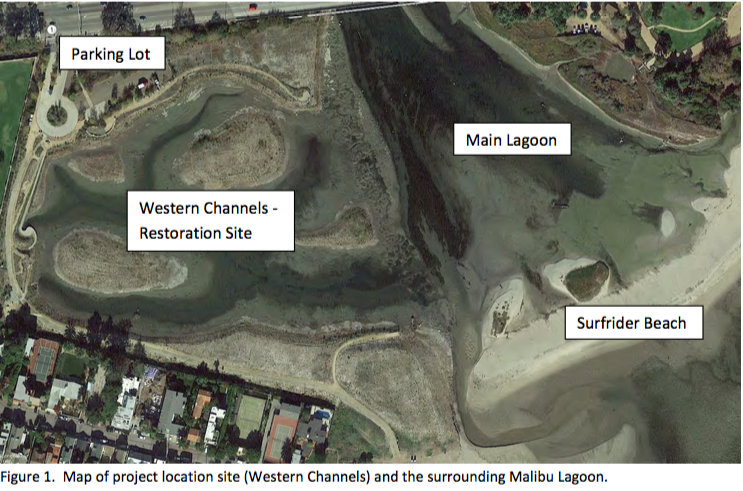 With ongoing restoration and re-vegetation the Malibu Lagoon continues to draw more visitors and researchers. Beginning in 2012, Growing Solutions collected, grew and helped plant site-specific native wetland flora that now covers the tidal islands created during the the three-year State Park restoration project. With the lagoon flushing daily with enhanced tidal flow, the lagoon is seeing cleaner water and increased wildlife. This has been a boon for local birdwatchers and visitors. The California least tern is now nesting in the lagoon after a seventy-year absence and the tidewater goby population has increased leading to increased bird populations and a healthier wetland ecology all around. For a report on recent steelhead trout sightings, click here. Malibu Lagoon in-planting by GS volunteers. The County Campus Foothill Open Space has "grown up” since planting in 2004. We now have near-total plant native cover that’s hosting birds and wildlife while providing a great place to take a walk. Since receiving the SWANA (Solid Waste Association Of North America) award in 2008 the site has only gotten better. We appreciate county’s staff innovative management of the site and the hundreds of volunteers who worked with us to prep, schlep and plant. Currently we are focusing on the entrance road to the Hearts Therapeutic Riding Club. Over the last 12 months we have planted over 20 native trees and 500 native plants that will fill in and provide soil stabilization, pollinator habitat and a fragrant visual feast for those who appreciate native Southern California flora. 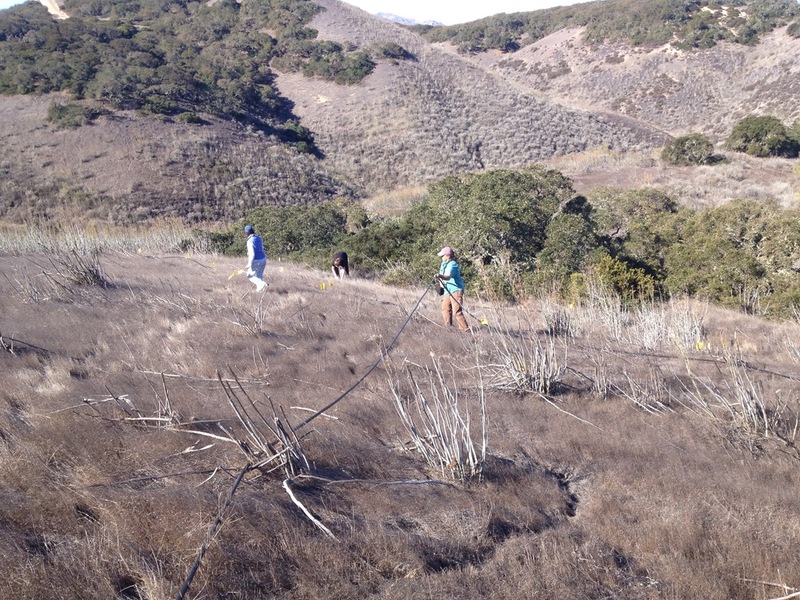 Students from SBCC Ecological Restoration class sailed to Santa Barbara Island this past spring and fall to continue restoration efforts on the Island. In spite of the lengthy drought which spurred extraordinary efforts to get water to this desert island, the plants are surviving and thriving. We are seeing seedling recruitment from some of the species …a very encouraging marker of a plant’s ability to sustain itself. Further, we are seeing the return of Scripp’s Murrelts and Cassin’s Auklets as the native nesting groundcover increases. Heartening signs! Besides planting over 3200 plants students weeded the notorious crystalline iceplant, Mesembryanthemum crystalline, leading to lively speculation about 19th-century sailors who likely brought the South African native to the island in their travels (some say as a supposed syphilis cure). Growing Solutions’ staff, volunteers and students have been involved from the beginning in this exceptional project. Overall combined efforts from staff, volunteers, interns and students have resulted in 30,000 plants in the ground on five sites along the island perimeter increasing the seabird habitat by seven acres. For video and more information CLICK HERE. 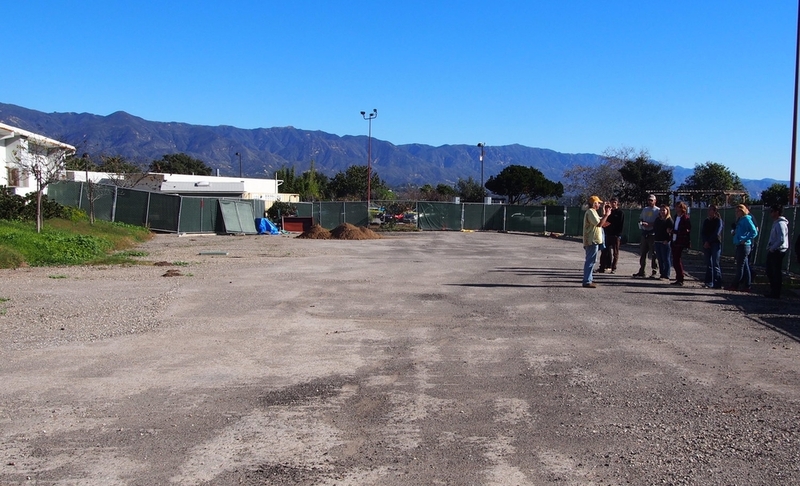 Click here for the latest news on bio remediation - bringing back the soil now that the portable classrooms are gone - from Santa Barbara City College's The Channels newspaper. Professor Karen Flagg directing traffic at the site. When the clipboard comes out and the finger starts pointing, it's showtime, folks! This spring Santa Barbara City College is literally breaking ground to grow food literacy along with tasty organic produce. Responding to increased demand for healthful locally sourced food, the college has designated an eighth-acre garden plot formally paved and occupied by disused portable classrooms. After de-paving and mulching the site to restore soil vitality, students from Environmental Horticulture 207 (Small Scale Food Production) will build, fill and maintain a series of raised-bed vegetable plots. Early crops will include organic salad greens like butterleaf lettuce and arugula along with cool-weather annuals such as kale and rainbow chard. As the weather warms over the spring, volunteers and staffers will layer in sun-loving heirloom tomatoes and peppers. The organic veggies and herbs will be hand harvested and used by SBCC’s acclaimed School of Culinary Arts and Hotel Management to feed students, staff and faculty. "Whatever you grow, we will make it taste good," says Charlie Fredricks, new head of the Culinary Arts program. Growing Solutions’ Don Hartley, along with SBCC grounds supervisor Mark Broomfield (a former EH student), will be supervising construction and maintenance. Stay tuned…more updates as we progress on this exciting new venture! Don Hartley of Growing Solutions doing initial garden-site survey in December 2014. After removing portable classrooms and depavingthe site, mulch is added to revive dormant light-starved soil. First raised-bed veggie bed going in, Jan. 27, 2015.